Hear the difference an Audiologist can make. Start Your Path To Better Hearing Today! Sound is transmitted through the air as sound waves from the environment. The sound waves are gathered by the outer ear and sent down the ear canal to the eardrum. The sound waves cause the eardrum to vibrate, which sets the three tiny bones in the middle ear into motion. The motion of the three bones causes the fluid in the inner ear, or cochlea, to move. The movement of the fluid in the inner ear causes the hair cells in the cochlea to bend. The hair cells change the movement into electrical impulses. These electrical impulses are transmitted to the hearing (auditory) nerve and up to the brain, where they are interpreted as sound. The visible part of the outer ear is called the pinna, or auricle. The pinna, with its grooves and ridges, along with the ear canal provide a natural volume boost for sounds in the 2000-3000 Hz frequency range, where we perceive many consonant sounds of speech. The ear canal, also called the external auditory meatus, is the other important component of the outer ear. The ear canal is lined with only a few layers of skin and fine hair, and is a highly vascularized area. This means that there is an abundant flow of blood to the ear canal. Wax (cerumen) accumulates in the ear canal and serves as a protective barrier to the skin from bacteria and moisture. Earwax is normal and varies in amount based on the person. It only becomes problematic if it completely blocks the ear canal. 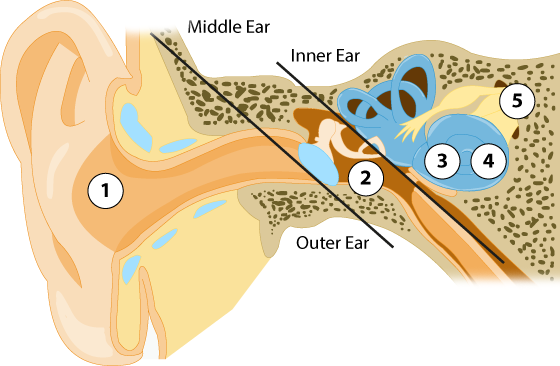 The eardrum, or tympanic membrane (TM), is the dividing structure between the outer and middle ear. Although it is an extremely thin membrane, the eardrum is made up of three layers to increase its strength. The ossicles are the three tiny bones of the middle ear located directly behind the tympanic membrane. These three bones form a connected chain in the middle ear. The ossicles take mechanical vibrations received at the tympanic membrane, increase the strength of these vibrations and transmit them into the inner ear. The Eustachian tube is the middle ear's air pressure equalizing system. The middle ear is encased in bone and does not associate with outside air except through the Eustachian tube. This tubular structure is normally closed, but it can be involuntarily opened by swallowing, yawning or chewing. It can also be intentionally opened to equalize pressure in the ears, like when flying in an airplane. When this happens, you might hear a soft popping sound. The inner ear is an organ located deep within the temporal bone, which is the bone of the skull on both sides of the head above and to the sides of the outer ear. The inner ear has two main structures: the semicircular canals and the cochlea. The semicircular canals do not contribute to hearing, but assist in maintaining balance as we move. The cochlea is the hearing organ of the inner ear, which is a fluid-filled structure that looks like a snail. The cochlea changes the mechanical vibrations from the tympanic membrane and the ossicles into a sequence of electrical impulses. Sensory cells, called hair cells, bend in the cochlea as the fluid is disrupted by the mechanical vibrations. This bending of the hair cells causes electrical signals to be sent to the brain by way of the auditory nerve. The cochlea is arranged by frequency, much like a piano, and encodes sounds from 20Hz (low pitch) to 20,000Hz (high pitch) in humans. Take our hearing health survey and start your journey to better hearing! Find out what our Audiologist can do to treat your hearing loss!